2am - Having had a celebratory cup of tea at Dan Richards house (Wales being a dry village!) we are going to get our heads down for a few hours before setting off down the coast to Teller. Nicky is away until Sat night (Sat am here) so there won't be any more updates till then. Please would our sponsors feel free to use the photos below and we will get some high resolution ones to them once we are in Nome. 00.50 hours - We've landed! Now driving down the beach in Wales having been in the water 6 hours and 50 minutes making the total crossing 18 hours and 50 minutes. Alex and Ann win the competition! 12 Midnight - We passed through the currents and have picked up speed again. We are now 4km from Wales and Dan Richards and a welcome party have come out in a boat to meet us. I estimate we will land in about an hour. 10pm - We are still making progress however 12km from Wales we hit the "Wales currents" which have slowed our progress down considerably to 1.4knots/hour. 8pm - we're going really well and doing 4.5knots/hour. 6pm - We've set off ! Steve and Dan are in the Land Rover and Adam and Mac are in Jerry's support boat. 12 noon - We're on Sunny and Clyde's boat on route to Diomede. The sea is flat and calm and there is very little wind. There is however a heavy sea fog and although we are only 3km from Diomede we cannot see it. Because the conditions are so good (and we have GPS!) 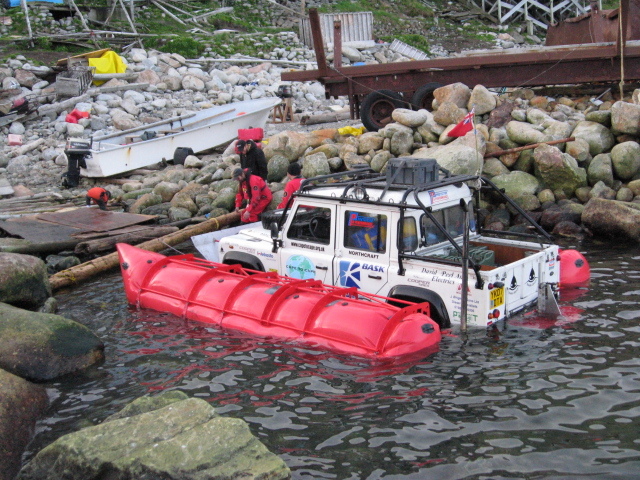 we are going to try and get the Land Rover ready and set sail as soon as possible after we land. The team on the beach at Wales. It will be a month tomorrow since we first departed across the Strait from Uelen however hopefully we will be back on Diomede tomorrow either by mail helicopter or boat. The weather has been nice one day, foggy the next but we are quite encouraged. We are staying at Dan and Ellen Richards. Its Ellen's brother's Sunny and Clyde, that have the boat. They have also offered to support us down to Teller (on-route to Nome) once we have completed the Bering crossing. There are no roads out of Wales and so we will be sailing down the coast until Teller - where the road to Nome begins. We've booked flights back! Dan is returning with me along with his brother Adam and Mac Mackenny. Leaving Manchester at 11am Monday 4th and arriving in Nome on Tuesday 5th at 9am. We are hoping to catch the barge that is delivering goods to Diomede otherwise it will be a mixture of boats, flights and helicopters! The weather is still variable but we have been keeping a close eye on the forecast at National Weather Service, AK and are hoping to grab another weather window. Many thanks to Crossley Evans for their generous contribution to the expedition. We have also received donations from friends and family for which we are very grateful. Still no large amounts of sponsorship coming in however we are making plans and gathering information in order to return to Alaska within two weeks. We have been featured in the Nome Nugget and have put hundreds of photos on the Album page. We have been pursuing finance but as to date haven't found a sponsor willing to put up enough money. Steve has sorted the photos out and they will be added to the website this weekend. At home the weather is better than it has been so unfortunately we are very busy trying to make hay! Uelen - airport transfer vehicles! We're going to try and get back this year - later in July and so we are trying to raise funds and sponsorship to help us do this. This morning Steve and Nicky went to Radio Leeds and did an interview that will be aired today (Tuesday) at 5.10pm. We will tape it off "Listen Again" tomorrow and put it on the website hopefully. We have hundred's of photos which Steve is sorting at the moment and will appear in the Gallery soon. The two men below are Ronald Ozenna (on left) and Robert Omiak (on right). They are the two boatmen that took us from Diomede to Wales in their boat. Steve arrived safely. The decision to be made now is whether to raise funds and get back to Alaska this year ; before the summer ends or wait until June/July 2009. The Land Rover is be perfectly serviceable this year whereas after surviving a winter on Diomede it would require a lot of maintenance to replace parts damaged by cold and sea water. Steve is on a flight from Anchorage to Newark at the moment from where he will fly to Manchester arriving Sunday morning (UK time). Having sailed across the Bering Strait in a boat to Wales and experienced at first hand the sea conditions they are both very confidant that the Land Rover will be more than capable of completing the crossing with the right weather and the support team. Both Steve and Dan have commitments back in the U.K and have already been away a lot longer than originally anticipated. This break will allow them to organise everything so that when they return to Diomede the crossing will go smoothly and to plan. Eventually we got a charter flight to fly us through the fog out of Wales to Nome. Dan got straight on a flight to Anchorage and onto Heathrow and should be arriving Saturday morning (UK time). From there he is going to Billing Land Rover Show where Protection and Performance have a stand. We got the boat across yesterday but missed the flight to Nome. Today it is foggy here and flights have been cancelled. We are staying at Dan Richards house while we try and organise a flight or helicopter to Nome. 1pm - The weather hasn't improved and the helicopter has been cancelled and so we are getting a boat to Wales. We should be there in about 3 hours. From there we will catch a flight to Nome. 12.30am - We have looked at a number of forecasts and the weather seems to be improving tomorrow for about 15 hours so we're off for a talk with Jerry to get his opinion. The weather is being unseasonably rough and there is no evidence of a permanent change to good weather in the near future. The mail helicopter comes in today about 1pm from Nome. If the weather isn't good enough to sail today Dan and I might fly out and wait in Nome. 12.30am - The weather was quite bad yesterday and the sea swell has increased. Today the wind has dropped again but its looking like the weather isn't set for a permanent change for quite a while. Below are pictures of the Land Rover looking the part! 1pm - It was quite disappointing to have to turn round but by the time we set off the winds had already started to turn direction and were soon coming from the south. On the way back the seas did increase but didn't really affect us. We will have a review of the weather in the morning. 6pm - We set off but Jerry wasn't happy about the weather and so we had to turn round and head back to Diomede after an hour. As you can see from our first marker we were making good progress. 11pm - The wind has been from the North for 4 hours now. Jerry is ringing Wales for the weather conditions there and Dan is getting more sleep. 2pm - Late update. Nicky running again and Jerry is washing his hair (and Dan is waiting to). The sea looks better today. Once hair washing is finished we will assess the weather and make a decision about whether we can go or not today! Everybody is frustrated with the weather - the fishermen want to fish and go whale hunting and there are people waiting to cross to the mainland. So if we can go I will ring Nicky and hourly updates will start again! 1am - The sea is looking much better now. Wind from the south still; it it turns then we will be able to go to Wales. The current doesn't run far although it is strong. We are going to head in a line between south tip of Diomede with Cape York. When the current catches us hopefully it will carry us north in time to hit Wales. You can in effect get behind it. I have just watched a whole school of whales pass by. Lots of squirts but only one classic "tip in the air tail". 12pm - Not moving today yet. I'll give you a bit of background information on Diomede. Its basically a solid lump of granite that rises up about 1300ft and is 3km in circumference. About 140 people live here in little prefab houses that cling to the rock just above the sea. Mostly native to the island living on seal, walrus, whale and fish. At this time of year millions of sea birds nest on the cliffs so they eat bird eggs for the next two months too. There is a small store selling essentials (including pepsi, coke, doritos etc). Daylight at the moment is 24 hours; the sun just dips out of sight for about half an hour. We have been made very welcome and are getting good advice on the surrounding currents and weather. Apart from the occasional trip over to Wales by boat the only contact is the weekly visit of the mail helicopter from Nome which brings supplies as well. The island is really quite self sufficient; collecting water from a rain fed spring. There a school, post office and a council office. 1am - There is still a small boats advisory out until Saturday when the winds are supposed to swing round to Northerly. I have sent pictures through of the Land Rover coming into shore, me and Dan clearing rocks this morning and Nikolai talking to the Customs in Uelen. 1pm - Dan has just come back from the washerteria where for $3 we can have a shower. The wooden hut/house we are in is quite basic but it is warm. We are sleeping on the floor using the Bask sleeping bags as mattress and sleeping in our lighter bags. Last night we even watched a dvd that we borrowed on Dan's computer. This morning we are going to go down to the launch area and move rocks so that we can re-launch the Land Rover. Although the weather is much the same there seems to be activity around the boats today as if they expect to be able to sail soon. I must give a mention about the Shark Suits that we wear while out on the Land Rover at sea. They were made specially for us and we have found them very comfortable to work in plus very warm. Although I have no wish to end up in the sea I would be confident wearing one these suits of at least surviving! 1am - I have sent some photos through below. Basically the crossing so far has gone well. Once we had set off we had two hours of good weather and were doing 10km/hr. Then the currents got stronger but for five hours we managed 7km/hr. Then we hit some strong currents of 4knots plus we had some fuel contamination which meant the Land Rover was running at three quarters power. In the shelter of Diomede the waves abated but overall it took us 3 hours to reach the island. There we had the difficult task of getting the Land Rover up onto the shore as the "beach" is all rocks. The problem we have is that the propeller is only two foot off the ground and so catches on rough ground. 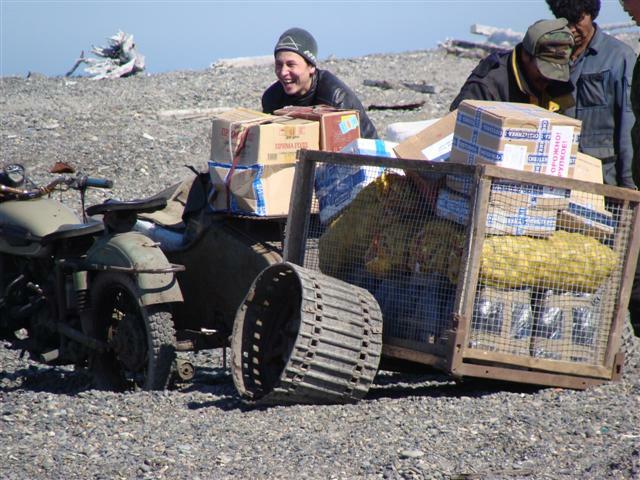 The residents of Diomede were amazing and while we winched they moved rocks. While we are waiting we are trying all the local dishes (another pastime of mine) such as Muktuk (whale skin), also walrus mammary gland and heart. Then we have also tried seal flipper. Uelen and my view from the driving seat! 1pm - The winds and the sea have dropped considerably but Jerry says they will still be too strong out in the Strait and that its not safe to sail. We have checked the Land Rover over and it is fine. We are going to offload some weight into Jerry's boat when we sail to try and get more speed. Most of our weight is fuel - the tank holds 140 ltrs and we are also carrying 120 ltrs in cans so in total we have a quarter of a tonne there. We are using 15 ltrs/hour which is comparable to on the Irish Sea when we used 12 ltrs /hour. I have given Nicky lots of information for her interview tomorrow - mainly about the local food we are trying but also the crossing so far. Nicky is going to try and "Listen Again" and record it so that we can put it on the website. 10am - Radio Leeds have interviewed Nicky this afternoon. Snipets will be broadcast tomorrow (Thurs 10th) as bulletins throughout the Breakfast programme from 6am to 9am then there will be a live interview at 6.50am (with Nicky)! They have asked if I can do a "Drive Time" live interview next week which will be exciting. 5am - Looking at the weather the forecast is for S/SE winds right through the weekend now but lighter and with calmer seas than originally forecast. 1am - Jerry logged onto the National Weather Service, Alaska Region Headquarters, AK site earlier and confirmed that the forecast is for SE winds until Friday. 1pm - the weather last night was very bad - we would have been in serious trouble if we had been out in it. The waves were 10ft high and it was blowing a gale all night. Today the wind has dropped a bit and visibility is better - I can see Big Diomede. The weather is supposed to improve on Wednesday afternoon but still be SE 20 knot wind with 7ft waves. We could really do with a northerly wind which the forecast says we will get on Friday and Saturday. So if we are here till then - we are - not a lot we can do about it. We have got the satellite phone set up to receive emails but the connection isn't consistent enough to send any pictures. 9am - the storm is due to be here until tomorrow. While we sit it out we are putting our minds to the complications of turning the Land Rover round on the rocks and re-launching it. Below are a couple of pictures that I took when I flew into Diomede in May. 1am - It is still blowing a gale and we have gone back to bed in an attempt to adjust to the time difference. 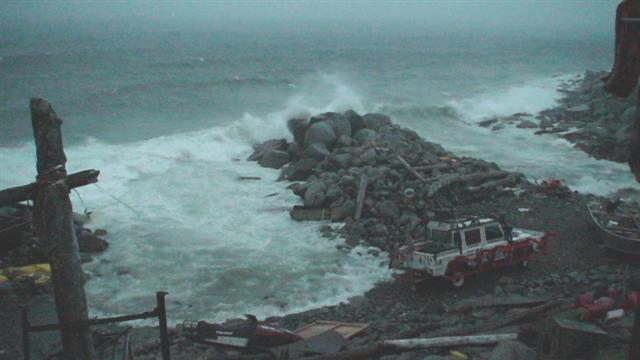 Link to National Weather Service, Alaska Region Headquarters, AK which gives a small boat warning for tonight in the Straits - I would think a Land Rover would fall under that category! 1pm - Having had 4 hours sleep we woke to a gale blowing outside and waves coming right up over the shore. We want to thank the villagers very much for warning us about the weather and also doing everything they could to help us get the Land Rover up onto the rocks. I have taken a photo of it sat all on its own on top of the rocks. I think we will be here at least 12 hours. The time when we arrived at the shore was 7.30am Mon U.S time which equates to 4.30am Tues Russian time. Meaning we have a just over half way time of 12 hours. 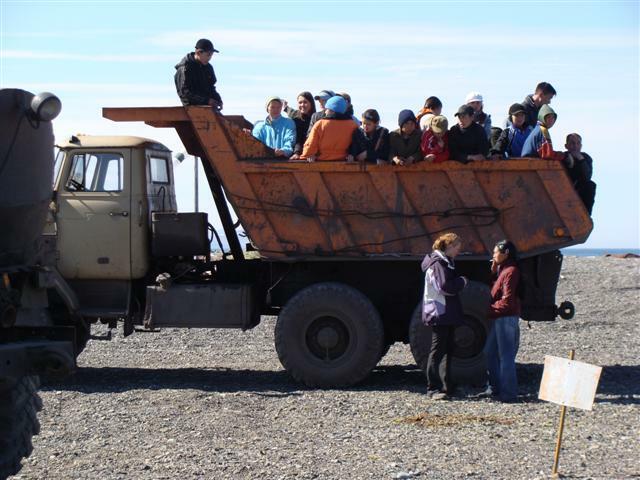 9am - We arrived on Little Diomede and all the village came out to welcome us. The weather is coming in and so we will wait up for a few hours and hope it abates. All the villagers have pulled their boats up from the shore and have been wonderful moving rocks and helping us winch the Land Rover right up out the sea too. We have just had bacon and eggs with the village leader and are going to sleep for 3/4 hours before figuring out how we can re-launch the Land Rover off the rocks. By then hopefully the weather will have calmed down! 6am - Jerry has been with us for the last hour and we are just approaching Little Diomede. Progress has slowed as conditions have got rougher. We will be able to rest and wait out the weather on Diomede. For the competition - the clock will stop when we go ashore. I'll put a half way time up but its roughly 11 hours so far! 4am - As we haven't slept, its quite dark and the sea is getting rougher we have decided to try and stop on Little Diomede for few hours. 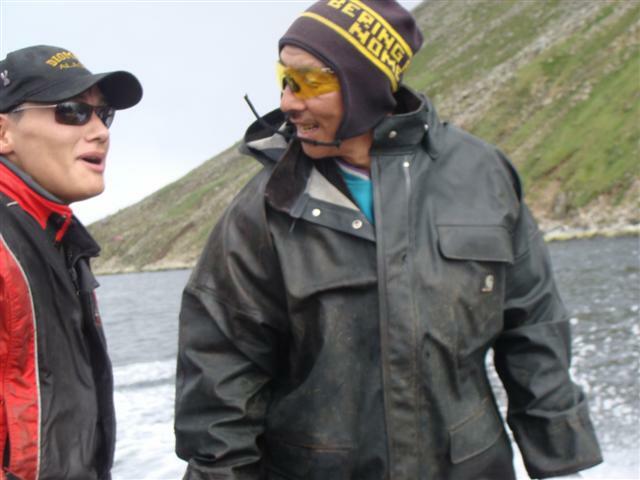 We have been in contact with Jerry (our support boat) on Little Diomede and he is coming out to meet us. 1am - we have just crossed the dateline therefore we are now in the U.S and its Monday 7th at 4am. 10pm - We have rigged the roof antennae up for the satellite phone which has helped communications. We are going against a headwind but still managing between 6 and 6.5km / hour. For food we using Crosse and Blackwell self-heater meals. Next update will be about 12.30 (only because Nicky is going out!). 9pm - The sea is quite a bit flatter now however we are going against the current. We are doing about 6.5km/hour which is ok although we were hoping to be a bit faster than that. 8pm - It was quite rough for a couple of hours but the waves have eased off a bit now and we have picked up a bit more speed. Initially we were only doing about 5km/hour. 6pm - At 8am this morning a cruise ship anchored offshore and a boat came in and then went to the Border Guard building. It was the Customs officials having got a lift with the ship. After a hectic day we set off at 4.30pm. We have been going two hours and can see the Diomede islands. It is rougher than we expected but we are making good progress.